For centuries, massage therapy has been used all over the world to ease the body, mind, and soul. A massage from one of our expertly trained therapists is truly one of the most relaxing experiences you can have. Massage not only targets specific problem areas, but it alleviates the stress of your day to day life so that you can feel even better than ever. Whether you are looking to indulge the senses with an aromatherapy service, or ease muscle tension through a deep tissue massage, we offer a variety of modalities to address what ails you. 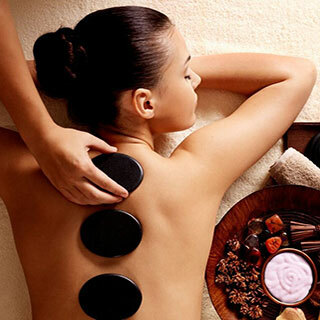 A relaxing and conditioning massage using an aroma blend of oils. Relieves aches and pains. Enjoy a natural approach to relaxation. A deeper manipulation of the muscle to release specific problem muscle groups that reach tension-retaining areas of the muscle tissue. Classic massage techniques – gentle muscle manipulation, improves circulation, improves flexibility, and relieves tension while creating a profound sense of relaxation and well-being. A welcome rest for the skin. This unique Asian wellness treatment using Green Tea, Ginseng, and Ginkgo Biloba balances and calms the skin while warm lava stones and traditional oriental massage techniques release vital energy and relax the body and soul. This pressure point therapy works reflexes in the feet and hands, which correspond to specific points of the body. Reflexology promotes relaxation, adjusts the body’s energy flow, aids in circulation, and detoxification. Give your tired, neglected feet a treat is to pamper them with a relaxing stimulating foot massage.